Over 75% of the adult population suffers from gum disease, and many of them are unaware they have it. Do your gums bleed when you brush your teeth? Do your gums appear red or swollen? If so, you may have gum disease. Gum disease results from excessive harmful bacteria that invade the gum tissue surrounding the teeth. If left untreated, it can cause damage to gum and bone tissue, leading to tooth loss. Thankfully, though, gum disease is preventable, and existing gum disease can be treated. The best way to fight gum disease is to prevent it. Do so by following these easy tips. • Brush your teeth twice a day, preferably with a toothpaste that is FDA-approved to fight gingivitis. • Use an anti-bacterial mouth rinse daily. 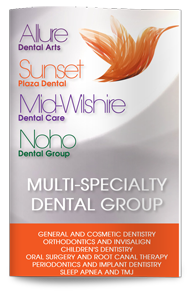 Both OTC and prescription rinses exist that fight gingivitis. • Get professional cleanings at least twice a year. More frequent cleanings may be recommended for those prone to gum disease. If you already have gum disease, there are ways your dentist can treat it and reverse its effects. The specific treatment chosen will depend on the severity of your condition. • Scaling and root planning, or deep cleaning, removes plaque and tartar from below the gumline. • Medications such as antibiotics can be used to reduce harmful bacteria. Some people are genetically susceptible to developing gum disease, regardless of their oral hygiene practices. If you think you may have gum disease, schedule an appointment with our periodontist in West Hollywood to discuss the best treatment for you.